We had a lot of fun yesterday when everyone aboard got an email on the ship’s Intranet from David Forcucci, the Marine Science Coordinator for Healy and a marine biologist by training, saying there would be the opportunity to shoot arrows off Healy’s stern at 1630 hours. He looked surprised at how many people showed up from both science and ship’s crew. Shoot arrows off the ship? Hell yeah. We launched 50 arrows yesterday out into the Bering Strait, all handmade from Tonkin bamboo, no plastics of any kind, using traditional bows made by Jay St. Charles of yew and spruce. Each arrow was marked with www.driftarrow.com (check it out). We got to decorate them as we wanted with Sharpie pens. Rather than a message in a bottle, we’re sending messages on arrows. Dave’s hoping to track the progress of these floating message-bearers around the Arctic Gyre—the big oceanic circulation circumnavigating the North Pole, maybe all the way to Europe. He’s counting on people up here in the far North to take a second look at bamboo—something rarely to never seen up here—pick up an arrow and register it at his website. Dave’s arrow project is more fun than hard science. He’s hoping local kids will get involved. He and Jay have already involved five school groups in the Seattle area who have decorated a few hundred drift arrows. 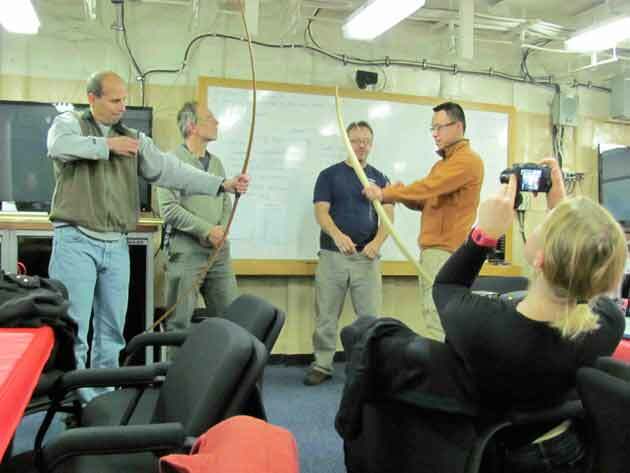 Andrey Proshutinsky, an oceanographer from the Woods Hole Oceanographic Institution, will be using his computer model to predict where the drift arrows travel in the Arctic current system. Dave also will be deploying a high tech satellite buoy alongside one quiver of arrows launched from from Healy, which should enable him to get daily positions on their drift.